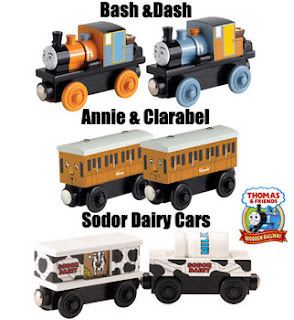 You Will Receive a Set of Bash & Dash Cars, Annie & Clarabel Cars, and Sodor Dairy Cars! Buy Up To 4 Sets (That’s 18 Wooden Railway Cars Total!) With One Low Shipping Price! Bash & Dash – Meet Bash & Dash! Inspired by the DVD, “Misty Island Rescue”, Bash & Dash are a logging locomotive from Misty Island. He and his twin Dash are a mischievous pair who always finish each other’s sentences. They are playful and eager but get things wrong because they don’t have any rules on Misty Island. Sodor Dairy Cars – The people on the Island of Sodor need milk, and they can always count on the Sodor Dairy Cars to deliver it. The children especially love to see the Dairy Cars and hear the cows moo as they pass by. This new and exciting addition to the Thomas line plays a “moo” sound when a little engineer slides the side door open to see the cow. Includes milk cargo car with removable milk barrel. Two button cell batteries required (included). Annie & Clarabel – They are Thomas’ two faithful coaches. They were given to Thomas as a reward for proving himself to be a Really Useful Engine. Annie carries passengers and is always pulled by Thomas facing him. Clarabel carries both passengers and luggage, and always travels behind Annie. Thomas Wooden Railway is not compatible with Take Along Thomas.